Atrial fibrillation is very common irregular heart beat that comes from the top of the heart (atrium). Atrial fibrillation usually results in the heart rate going fast (greater than 100 beats per minute) which causes many different symptoms and can even increase the risk of a stroke. The electricity of the heart is very complicated and atrial fibrillation can be thought of as an “electrical short circuit” requiring medications to control it, relieve symptoms and prevent a stroke from occurring. Atrial fibrillation is quite different from person to person in regards to what symptoms develop and which medications are needed. Some episodes of atrial fibrillation are brief (lasting a few minutes) and others can last days. Sometimes atrial fibrillation becomes permanent. Treatment for atrial fibrillation requires medications to relieve symptoms and to prevent a stroke. Why do I have atrial fibrillation? Atrial fibrillation is actually very easy to diagnose with a simple ECG tracing of the heart electricity as pictured above. To diagnose the cause of atrial fibrillation requires an echocardiogram (ultrasound test of the heart) to look for congestive heart failure and heart valve problems, a blood test to check for thyroid function and sometimes a stress test if coronary artery disease is suspected. Sometimes if the atrial fibrillation and/or symptoms come and go quickly, it may be required for you to wear a heart monitor at home to record the irregular heartbeat. Also, these heart monitors can be useful to see if the medications are working well enough to keep the heart rate at a normal level (less than 100 beats per minute) and to see how often the atrial fibrillation occurs. What medications can relieve the symptoms of atrial fibrillation? There are many medications which can relieve the symptoms of atrial fibrillation. How many medications and the dose of medication needed is different from patient to patient depending on many factors. There are two kinds of medications that improve symptoms: Medications that slow the heart rate down and medications that actually make the atrial fibrillation go away. Medications that slow the heart rate down: These include beta-blockers (i.e. metoprolol) that work by blocking adrenaline, calcium channel blockers (i.e. diltiazem) which work to slow the electricity of the heart down and digoxin. Medications that make the atrial fibrillation go away: These are called "Anti-arrhythmic drugs" since the actually stop the arrhythmia and restore a normal heartbeat. These medications can be complicated and are usually used only if symptoms are not able to be relieved in other ways such as slowing the heart rate down. Common anti-arrhythmic drugs include amiodarone, dronedarone, flecainide and sotalol. Why does atrial fibrillation increase my risk of stroke? Atrial fibrillation can cause a stroke, however the risk is different from person to person. When the top chambers of the heart (atrium) are not squeezing well and are just "fibrillating", the blood does not flow as smoothly. This can result in the blood cells sticking together forming a blood clot. If the blood clot breaks lose from the heart it can travel to the brain and cause a stroke. The clot commonly occurs in the area of the heart called the "left atrial appendage" as depicted in the image to the right. What medications can reduce my risk of having a stroke? The risk of having a stroke from atrial fibrillation increases depending on how many points you scored on the above scale. If you scored 0 on this scale then the risk is very low and no medications are needed to prevent stroke in most cases. If you scored a 1 on the above scale, then using a blood thinner would be reasonable, but not completely necessary. Those who score 1 need to discuss this with their doctor. Patients that score 2 or more would qualify to be treated with a blood thinner to prevent stroke. There are currently 4 blood thinners FDA approved to prevent stroke related to atrial fibrillation. These are warfarin (coumadin), dabigatran (Pradaxa), rivaroxaban (Xarelto) and apixaban (Eliquis). There are difference between these medications that you will need to discuss with your doctor. Doctors and patients should always have a discussion regarding the risk of stroke from atrial fibrillation versus the risk of bleeding from a blood thinner. Sometimes people who qualify for blood thinners to prevent stroke simply can't take them due to their high risk of bleeding. There are sometimes alternative treatments in this situation. What other therapies are available for atrial fibrillation? Cardioversion: This is a procedure done for atrial fibrillation to return the heartbeat back to normal. A cardioversion can either be done with a shock (electrical cardioversion) or with a medication (chemical cardioversion) and the risk of major complications is very low (less than 1%). A cardioversion is a common procedure done to relieve symptoms of atrial fibrillation when medications are not working. Atrial fibrillation ablation: An electrophysiologist (heart rhythm specialist) can perform an ablation procedure to cure atrial fibrillation in some instances. Since atrial fibrillation ablation is an invasive procedure, it is generally left as a last resort if medications fail to relieve symptoms. Pacemakers: When the heart rates during atrial fibrillation are not able to be slowed down by medications, a pacemaker can be inserted to control the heart rate. This is not commonly needed and is considered as a last resort in patients when medications do not work and if they are not a candidate for atrial fibrillation ablation. 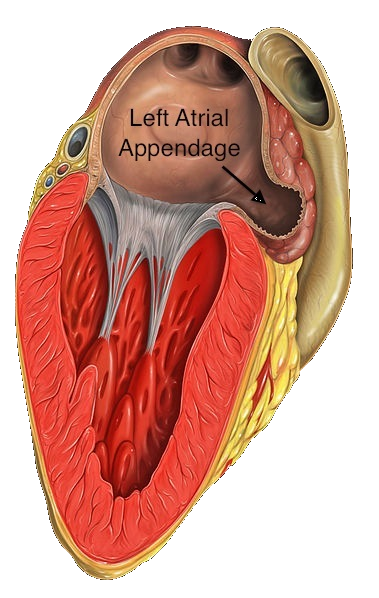 Left atrial appendage exclusion: When a person has a high risk of stroke from atrial fibrillation, but is not able to take a blood thinner due to bleeding, the left atrial appendage can be removed or excluded to stop a clot from forming there dramatically decreasing the risk of stroke.